Independently tested and certified by a leading national laboratory to meet the stringent requirements of FDA CFR 175.300, the EP42HT-2FG food grade two part epoxy system, from Master Bond, is also toxicologically evaluated to meet the NSF/ANSI 51.4.1 (2009) standard for food equipment materials. Capable of withstanding temperatures from -50 to +230 ºC, it resists steam, radiation and frozen storage conditions. With a volume resistivity of over 1014 Ω-cm, the epoxy also serves as a potting and encapsulation compound for electronic components and devices. It has a low viscosity of 55,000-110,000 cps for Part A and 75-130 cps for Part B at room temperature. Tensile strength is >82.7 MPa and a tensile lap shear strength is >13.8 MPa at 24°C. The two part epoxy offers easy handling with an open time of 45-75 minutes for a 100 gram mass at 24°C. The recommended cure is 3-4 hours at 65-93°C. Alternatively, it can be cured at room temperature overnight followed by a 2-3 hour cure at 65-93°C. The EP42HT-2FG may be used across a wide variety of applications in the food industry, such as bonding and sealing metals, plastics, rubbers and other substrates, commonly found on food service equipment. Featuring high resistance to chemicals and many solvents, along with boiling water, fats and oils, it may be readily used as a coating for storage tanks, bins, hoppers, and other containment vessels. Master Bond Inc. is a leading manufacturer of high performance adhesives, sealants, coatings, potting and encapsulation compounds and impregnation resins. Our line of products consists of epoxies, polyurethanes, silicones, acrylics, polyamides and latex systems. 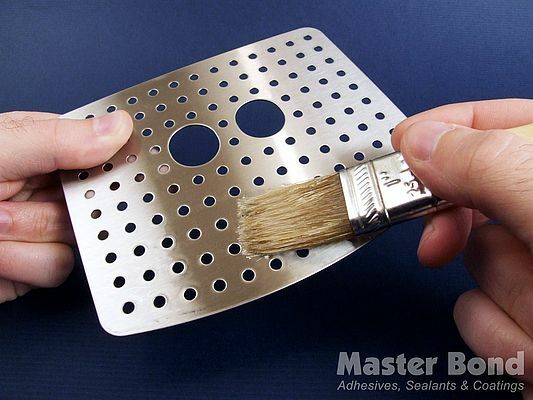 Master Bond's focus is on developing the best in epoxies, silicones, polyurethanes, polysulfides, UV cures and other specialty adhesive systems. One or two part systems, available in small and large quantities, designed to customer specifications. Master Bond EP21AR acid resistant epoxy is a two component epoxy resin system for high performance bonding, sealing, coating and encapsulating. It has a 100 to 50 mix ratio cures at ambient temperatures or more quickly at elevated temperatures. Master Bond EP30QF is a quartz filled, two component epoxy for high performance bonding, sealing, coating and casting, formulated to cure at room temperature or more rapidly at elevated temperatures offering The product offers chemical resistance. Masterbond's two component low viscosity silicone potting compound MasterSil 151 is tough and flexible, optically clear as well as vibration and shock resistant. This addition cured system does not require exposure to air for complete crosslinking. Master Bond formulates advanced adhesives, sealants, coatings, potting/encapsulation compounds and impregnation resins. Each compound is designed to meet specific needs and requirements with over 3,000 grades of specially designed formulations. Master Bond Polymer System EP38 is a fast curing, low viscosity, optically clear two component epoxy system for high performance coating, bonding and sealing. It is 100% reactive and does not contain any volatiles. The mix ratio is 3 to 1 by weight.